When mum felt that I was old enough to handle a chopper / cleaver, one of the first tasks she delegated me to do was to chop / mince meat on a chopping board. I actually loved chopping and had the pleasure of seeing the meat being minced up nicely (sounds scary, isn’t it?). For this recipe, which again, the photo does not do any justice to the delightful taste of the dish, you are looking at 3 ingredients only. Yes, 3 ingredients to make you happy. 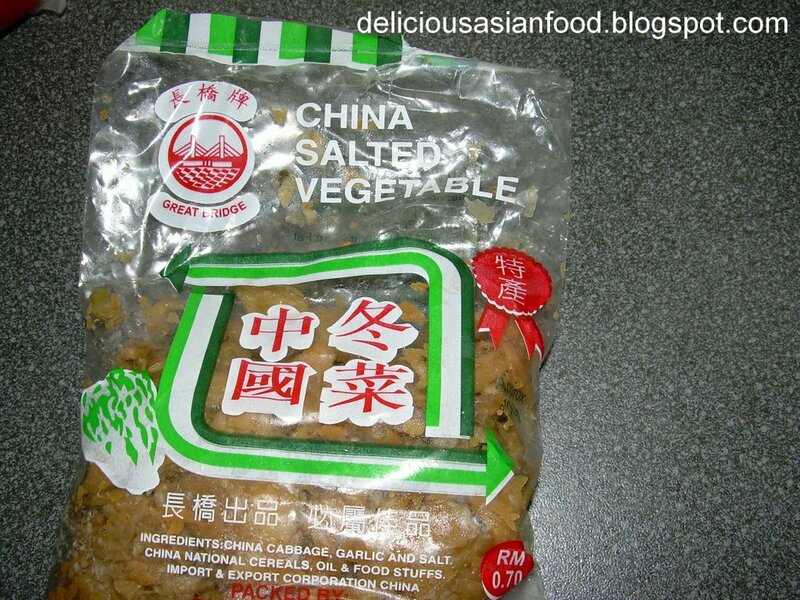 And they are easy enough to find save and except Tung Chye which is chinese salted vegetables which are brown in colour and comes in really small sizes. It is salty and you wouldn’t want too much of that. However, too little and the mince would not taste as nice. I guess it would be trial and error and depends on individual preference on the taste. Give it a try, anyway. Mince ingredients together and sprinkle some white pepper powder if you like. Put mince on a suitable plate for steaming. Steam mince till cooked (say, 5 to 10 minutes). To check whether it is cooked, insert a chopstick into the meat and if the chopstick comes out clean, it is cooked. hmmm simple dish like this is the yummiest! usually i will add a wee bit of soy sauce and corn flour. btw, last nite i saw on telly – steamed minced pork with waterchestnut and dried shiitake mushroom! i’ve done with the mushrooms but never with the water chestnut. must try! I wonder if tung chye is the same as giam chye? This is my kids’ favourite dish. They call it Chinese pizza! And it’s really super easy to make too. You changed your template? Quite Nice. 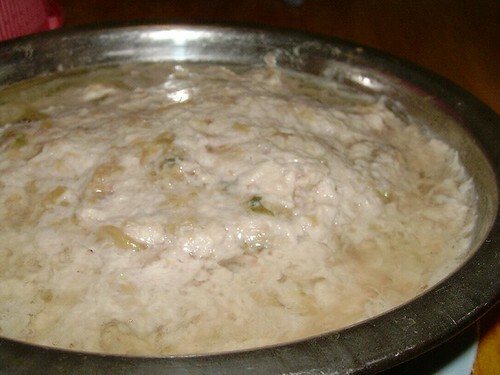 This dish my mother cooked so often while growing up, but I can’t find Tong Chai here…have to smuggled back next time. Hehe. This signature dish brings a lot of great memories during my childhood time. Great old memories. Thank you for sharing it with us. Tiu lor, that site which stole your posts? She stole mine too and I had complained to the blog provider. babe_kl : I think the water chestnuts would give this dish a nice crunchy feel, not to mention natural sweetness. But in a way, perhaps it might not be suitable for this dish as this dish is more known to be salty than sweet or balanced. decypher : Healthier than beef or lamb, I think 🙂 Welcome to the Pork Lovers’ Club! xin : It’s true that not everyone likes tung chye. How do you cook it with salted fish? Do you mince it all in? simcooks : No, they are different. Just click on the link and you’ll see the picture. Judging from what Bee Yinn says, you might need to ship ’em over. bkworm : How often do you serve these pizzas to your kids? Not too often I hope cos it’s kinda salty unless you minimise the tung chye. But then again, it’s just not the same without the saltiness. Rasa Malaysia : Yes, time for a change. Of course, I learnt it from sifu Lilian. big boys oven : That’s partly what this blog is all about. Come again! lilian : Got my email? Diss her. He! He! My mom had me mince meat too! I thought it was so fun. But she also made me pinch the tails off the bean sprouts which was not so fun. ParisB : Where should I run to…? Ha! Ha! Anyway, I’ve just got the stuff to write about but at the moment, no time ler…Can you remind me time and again, ah? Steamy Kitchen : LOL! Yeah, the bean sprouts procedure was more like child abuse, don’t you think so?